I don’t think it’s a big secret that I enjoy exercising as much as I enjoy getting my teeth drilled (which luckily has only happened once, and I no longer have those teeth so…) But what I do love is wearing work out clothes as soon as I get home from work. Don’t lie, I know you know what I mean. You get home, and the first, second, or third thing you do is strip off the uncomfortable bras and skinny jeans and into something… well, actually it is kind of tight, but in a much more forgiving and comfortable way. Yes, I’m talking about yoga pants. No, I don’t do yoga. Not yet anyways. But I can pretend in my yoga leggings that I basically live in on the weekends and have even figured out how to add into my rotations for work wear. With the cold season upon us, I figured now is as good as time as any to share my secrets for where I find my trusty leggings, yoga or otherwise, and for when I am dragged to the gym by certain people who shall not be named, what I like to wear. Fabletics was my first foray into the subscription work out clothing universe, and I’m so glad I tried them! Their compression leggings and crops are my absolute favorite, and I swear they make me look 5 pounds lighter. They come in a ton of styles and colors, and they have new collections each month with different fabrics. While I haven’t had the best luck with their tops (I ordered a t-shirt that’s too big, and a sweatshirt that was too small… both in the same size) I did love their sports bras. So comfortable for lounging around. Their return/exchange policy is super great if you do run into any problems, and if you sign up through my referral link, your first outfit is 50% off. $25-35 for an entire outfit is a pretty great deal, but don’t forget that it will sign you up for a monthly subscription. You can either skip the month between the 1st and the 5th, or cancel the service completely. I’ve been buying work out gear at Old Navy for a long time. I love the yoga pants and crops. So comfortable! They also last for a long, long time. I have a couple of pairs that I wore in college. (Yeah, that was about 5-6 years ago now…) Plus they run coupons and sales all the time, so you really can’t go wrong here. While I had heard of Athleta, it is a new to me find. What I really like about Athleta is that a lot of their “work out” gear doesn’t look like it. They have a wide array of things I could wear to work and get away with it, like the above cashmere cardigan (total splurge! ), the Slub Bombtastic Jacket, and the jogger pants. I’ve been buying sports bras from Victoria Secret’s Sport line for a long time, so when I saw that Influenster would be sending a sports bra my way from their new Knockout line I was pretty excited to try it out! I love the fit of their new style – so much support, and they have tons of sizes (and colors!) to choose from, including 32-40 band size and up to DDD cup size, which is pretty uncommon in reasonably priced sports bras. Obviously I couldn’t leave off Target, I mean, they have everything. Their C9 line is mostly what I buy for Dave – socks, shorts, t-shirts… but I’ve also bought running tights and a zip up that I absolutely love there too. I find the quality comparable to items double their price, and I think they hold up long-term too. Make sure you check out the Cartwheel app and their coupons online – the by Champion line goes on sale all the time! For comfy, inexpensive yoga pants, I love Kohl’s in the juniors section. They run fairly true to size, and last quite awhile. Two years ago, I bought a pair during Black Friday for $7. Get discounted sports and activewear year round at your local TJ Maxx, Marshall’s, or Ross. I swear the ones by my house ALWAYS have insanely full racks. Now I can’t recommend the workout gear from Zella at Nordstrom myself because I have yet to purchase, but I’ve heard they make the most amazing leggings ever. And no, even though I’m posting about work out gear I’m not becoming a fitness blog. I will never get up on any soap boxes and yell at you to eat cleaner, dine on a juice for a week instead of real food, or tell you how to do squats the right way (is there a wrong way? I don’t even know.) Really I just thought you should know where I like to buy leggings since it’s going to be winter before you know it. You’re welcome. Where do you like to shop for lounge and/or work out gear? I love Fabletics! I haven’t gotten any workout stuff from ON yet, but I want to! They have such cute stuff and it’s super affordable! Agreed, I’ve been really impressed with their fun colors and patterns lately! I swear by ON’s workout line. I love love their sports bras + love that every so often everything is $5. I mean, how can you not jump on that? Seriously, Old Navy has some awesome deals! I’ll have to be on the look out for the $5 deals! I love Fabletics. They finally just started shipping to Canada, but before that I had someone in the States putting in order for me. They are basically all I wear while working out, and I love how affordable they are! I looooove C9 by Champion. Mostly because it’s cheap, haha! Sometimes they have cute stuff though. Agreed, definitely cheap but I love the fashion colors they have, makes buying work out clothing more fun! I love these recommendations! I had the same problem with Fabletics, except its the capris that I have trouble figuring out the size for. Old Navy is definitely my go-to for inexpensive workout/lounge gear! For the capris (at least the compression ones) I had to size up from the recommended size (they said XS, I ordered S… I wear a 2 or Small in Old Navy, for reference.) Not sure on their regular fit on pants though! This is an awesome list! 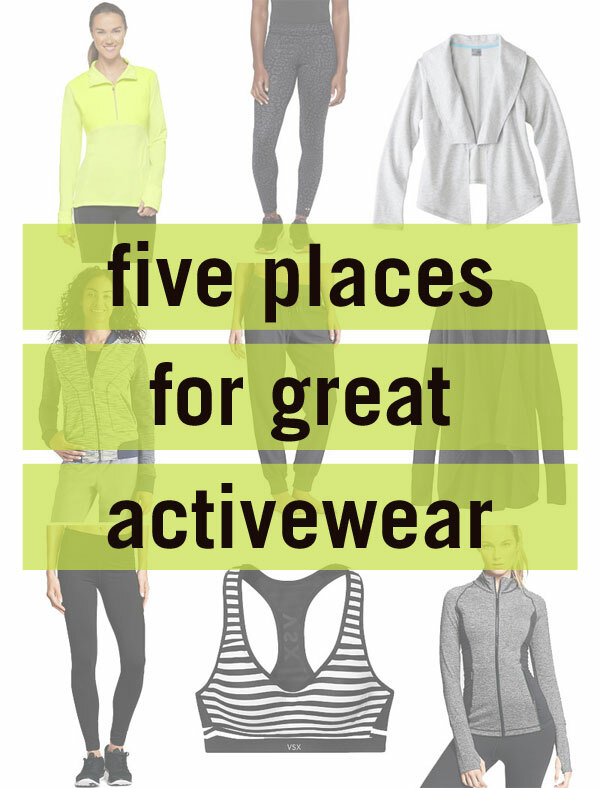 And I’m glad I’m not the only one who gets away with wearing active wear to work sometimes :) Have you ever tried any of the activewear from Gap? I haven’t recently… the last time I wore anything from the Gap activewear line I was in high school! Thank you for this list! I workout CONSTANTLY so I am always in the market or new workout gear. I buy Old Navy clothes religiously and I will definitely be checking out C9 thanks to you! So glad it was helpful! C9 is great and goes on sale all the time making it an awesome deal! I agree that workout clothes are very comfortable! I find really good workout clothes at Target. Target is definitely one of my faves! So is it bad that I think Fabletics is expensive and Athleta is off the charts, I just got $5 leggings at Old Navy and have bought some stuff at Fabletics, but have the same problem figuring out my size, got too big shorts and too small a shirt. Not at all. Fabletics is a great deal for the first outfit imo, since it’s half of the prices I listed, and its generally 3-4 pieces of clothing. Athleta is pricey, which is why I picked items that I would splurge on and incorporate in my wardrobe. There’s no way I would pay that much for something to exclusively get sweaty in! I just got my first outfit from Fabletics the other day and I LOVE it!! I love Ellie too, very fun gear, also a monthly subscription! Oh fun, I love Fabletics! I have yet to try or even check out Ellie. What do you like from them? Their leggings are awesome! I always get compliments on them! I like them better than lululemon! (shhh hahaha) and they have great jackets! I haven’t tried Fabletics just because I have read really bad reviews of the quality of the clothes and that canceling the subscription is not as easy as sending an email. Probably I should tried it. But I love Zella, the leggings are the best!! I used them for workouts but are comfy enough for “weekends” outfits and they don’t scream i am work out clothes. That must depend on what you buy because I really, really like their compression leggings. I can’t say I’ve tried much else, as that’s mainly what I buy for work out gear, and wear just normal t-shirts. I’ve never cancelled, I just skip each month before the 5th of the month. I believe you have to call and talk to someone to cancel, which is a pain! I just ordered my first pair of Zella leggings during the Nordstrom clearance sale! Excited to start wearing them, they’re super comfy! Great Recommendations <3 Even though you’ll be working out and you need to feel comfortable, you can still look good and feel confident.